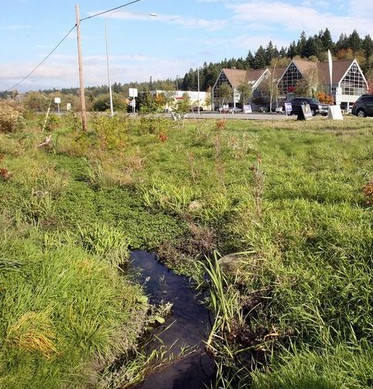 Poulsbo’s Fish Park will have a variety of experts on hand Saturday to talk about the salmon run in Dogfish Creek and other North Kitsap streams, as well as restoration efforts taking place throughout the region. Fun and educational activities for kids are part of the event, which will go from 9 a.m. to 2 p.m. My description of salmon-viewing events on Saturday had the wrong date for the event. Check out the flyer posted by Poulsbo Parks and Recreation. Paul Dorn, a biologist with the Suquamish Tribe, said the best bet to see salmon in the creek will be earlier in the day, as the tide will be incoming. Natural organic compounds called tannins tend to color the water brown, so it is not always easy to spot migrating salmon in the lower part of Dogfish Creek. If you miss them at Fish Park, it may be worth a trip to Valley Nursery off Bond Road, where I’ve often had luck seeing salmon. “We just finished a wonderful restoration project,” Paul told me, describing the installation of woody debris and gravel on a tributary of Dogfish Creek at Fish Park. It’s a small stream, he said, but it’s good rearing habitat for juvenile coho salmon and cutthroat trout, and adult salmon can go up the stream when the flows are high. Cowling Creek Center, 8 a.m. to 4 p.m., 20345 Miller Bay Road. 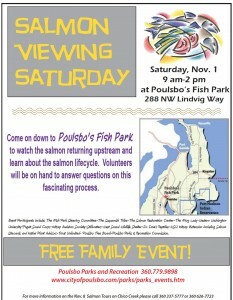 Chico Salmon Viewing Park, 10 a.m. to 2 p.m., adjacent to Kitsap Golf and Country Club, www.ext100.wsu.edu/kitsap. Mountaineers Rhododendron Preserve, 10 a.m. to 1 p.m., with walking tours at 10 a.m., 11:30 a.m. and 1 p.m., www.ext100.wsu.edu/kitsap. For a map of accessible salmon-viewing locations with videos that describe each spot, go to Kitsap Peninsula Salmon Watching. While there, check out the tips for successful salmon-viewing. 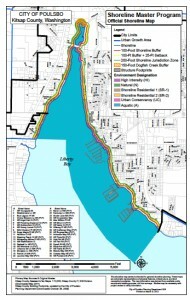 Poulsbo is the first local jurisdiction in Kitsap County to update its Shoreline Master Program, as required by state law, and send it on to the Washington Department of Ecology for ratification. The Poulsbo City Council approved the document Wednesday, as reported by Kitsap Sun reporter Amy Phan. Preserve and enhance public access and recreational uses along the shoreline. Keri Weaver, Poulsbo’s associate planner, does a good job outlining the content of the Poulsbo Shoreline Master Program in her staff report (PDF 224 kb) submitted to the City Council. The full SMP (PDF 552 kb) is more revealing and not difficult to read. Check out the shoreline maps to locate each of the environments. The always-controversial issue of buffers was settled during the previous update of Poulsbo’s Critical Areas Ordinance. The City Council saw no reason to revisit its justification for 100-foot buffers along the city’s saltwater shoreline on Liberty Bay and 150-foot buffers along Dogfish Creek, the largest stream draining into bay. In addition, 25-foot setbacks expand the no-building zone, but water-dependent uses and public access may be exempt from those setbacks. The city of Poulsbo now has a reasonable blueprint for restoring the South Fork of Dogfish Creek as money and volunteers become available. The city is the logical entity to lead the effort, considering that 90 percent of the 700-acre watershed lies within the city limits. The battle against pollution in Dogfish Creek has been going on for years under the leadership of the Kitsap County Health District. Much of the focus has been on septic systems and farming practices on the main stem of the creek, which flows down from the north through rural farmlands and housing developments, as well as the east and west forks of the stream. Remove, repair, and replace barriers to fish migration. Restore/create off‐channel rearing and high‐flow refuge habitat. Increase instream habitat complexity (e.g., install large woody debris, create pools). Improve low‐flow water quality conditions (e.g., temperature and dissolved oxygen). Improve high‐flow water quality conditions (e.g., sediment and chemical pollutants in stormwater). Improve connection to the floodplain (i.e., restore natural planform and reduce channel incision). Restore riparian habitat (e.g., restore native plant species, increase interspersion of different plant communities). Restore connection to floodplain wetlands. Enforce existing regulations that protect stream ecology.